It’s no secret that for the last couple of decades, the New York Yankees have been fond of older, more experienced hitters. This season in particular, the average age of their Opening Day starting lineup was 29 years-old – with only one position player, 25-year-old Didi Gregorius, under the age of 30. With age and experience comes a careful eye, at least in the case of the Yankees. 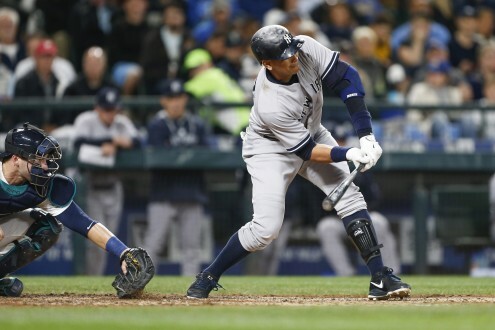 Entering play on Thursday the Yankees have been one of the hottest teams in baseball scoring an average of six runs per game during their recent seven-game winning streak. The key to their offensive success? Patience. All eight of the Yankees’ qualified starters are among the league’s top 115 hitters in pitches seen per plate appearance, while Jacoby Ellsbury and Chris Young, who have split time due to Ellsbury’s injury, would be among the 60 best with their current marks. The Yankees have been able to put balls in play and produce baserunners at any stage of the game, boasting the seventh-lowest strikeout rate (.191) and 9th-highest walk rate (0.082) in baseball. That’s created a hefty bunch of scoring opportunities. In particular, the top four hitters in the Yankees’ lineup have been the most problematic for opposing ballclubs. Brett Gardner has seen over four pitches per plate appearance on average, good for fifth-best in baseball, and has swung at just 23 percent of pitches outside of the strike zone, which ranks 28th in baseball. After him, the aforementioned Ellsbury and Headley have worked pitchers, and so has A-Rod. Rodriguez’s eye has also been exceptional, as he’s swung at just 24.6 percent of pitches that have missed the zone, and in turn he’s posted a toasty .373 OBP. Boy, have things ever set up nicely for Teixeira. He’s stepped to the plate 126 times with runners on base, and has had the opportunity to drive in 174 runners – both top-five marks in all of baseball. That’s led to an AL-leading 45 RBIs, and the fact that he’s been able to hit 20 HRs has been an added bonus. Not to mention, he’s been able to find some good pitches himself choosing to swing at just 22 percent of pitches out of the strike zone. Simply put, the way New York’s lineup has made opposing pitchers work has made it increasingly difficult to keep their pitch counts down and not make mistakes. The system the Yankees have in place has worked to perfection, especially when it comes to the top of the order. Hitting streaks will come and go, and so will power numbers. The one thing that looks steady about these Yankees, though, is their ability to put together good at-bats. That should help them win a lot more games this season. *Note: All Major League rankings for swing stats are for players with a minimum of 500 pitches seen.